Why did Sully build Notre Dame? It was 1160 AD, a hundred years after Matilda built the Abbaye aux Dames in Caen, and about the same time as they were building the new cathedral at Laon. The Bishop of Paris, Maurice de Sully, decided that Paris should also have a big new Christian church. After all, how could the French king allow his capital to have an old-fashioned church? The French kings were getting much more powerful, with climate change and conquering southern France. 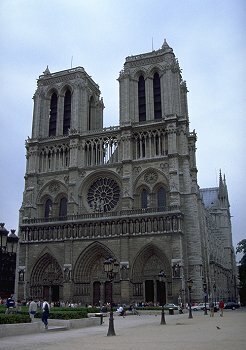 Paris needed a church in the new Gothic style, not the old church that had been on that spot since before Charlemagne. The builders began by tearing down the nave of the old church, leaving the choir (the apse) to say Mass in while the building was going on. They built the facade, or front, of the new church in three levels, which was the old Romanesque style. But they used pointed arches in the new Gothic style. This gave the front a more horizontal, strong look than later cathedrals like Rouen or Amiens, which had more vertical lines on their facades, and also more fancy carving. They rebuilt the nave in the new Gothic style, and as big as possible. Notre-Dame was the first building in northern Europe where the roof was more than a hundred feet high (though the domes of the Pantheon in Rome, and Hagia Sophia in Istanbul, were higher). To make the walls so high, the architect used a brand-new idea – the flying buttress. These stone arches helped support the walls, pushing back in against the weight of the six-part groin vault of the roof pushing out. What did Notre Dame’s walls look like? The elevation of the nave: arches, then a gallery, then a small opening, then a small window. As at Laon about the same time, Notre-Dame’s walls had a pointed arch and then a gallery where priests could walk or more people could see the Mass. Above that, Notre-Dame had a little more glass than Laon – a small round window, and then a pointed window at the very top of the wall. But there was still plenty of plain solid wall to help hold up the heavy stone roof. Although later cathedrals like Chartres had only tiny column capitals, so that your eyes would be drawn upwards to Heaven, here at Notre Dame you still see big, heavy column capitals, too. Cite this page: Carr, K.E. 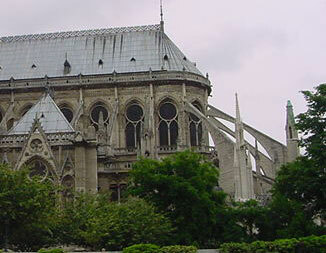 Notre Dame of Paris – Medieval Cathedral. Quatr.us Study Guides, July 31, 2017. Web. April 20, 2019.